Croatia housing markets are a story of two distinct but not entirely separate markets - local, and foreign. In the coastal areas popular with foreigners, prices continue to rise, while prices of dwellings in the rest of the country mostly continue to suffer. 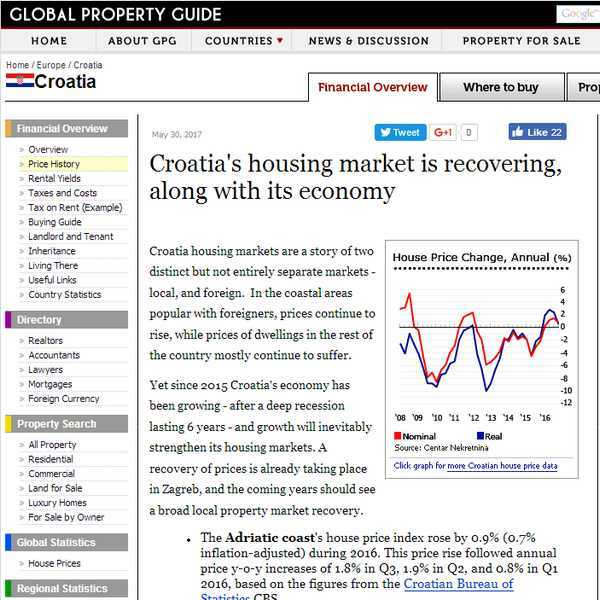 Yet since 2015 Croatia's economy has been growing - after a deep recession lasting 6 years - and growth will inevitably strengthen its housing markets. A recovery of prices is already taking place in Zagreb, and the coming years should see a broad local property market recovery. - The Adriatic coast's house price index rose by 0.9% (0.7% inflation-adjusted) during 2016. This price rise followed annual price y-o-y increases of 1.8% in Q3, 1.9% in Q2, and 0.8% in Q1 2016, based on the figures from the Croatian Bureau of Statistics CBS. - In Zagreb city house prices, in general, have been rising for the last three quarters. In Q4 2016, house prices in Zagreb city were up by almost 2% y-o-y (1.8% inflation-adjusted), following y-o-y growth of 2.1% in Q3, and 0.1% in Q2 2016. However the average price of new dwellings in Zagreb sharply dropped by 11.5% (-11.6% inflation-adjusted) y-o-y to HRK 10,445 (€1,396.31) per sq. m., suggesting that there is still an overhang of new homes. - The nationwide house price index for existing dwellings increased by 1.8% y-o-y (1.6% inflation-adjusted) In Q4 2016, while the national house price index for new dwellings dropped by 4.7% y-o-y (-4.9% inflation-adjusted). Croatia's star property performers are coastal regions like Šibenik-Knin County (4.2% up y-o-y to €1,650 per sq. m.), Istria County (3.13% up y-o-y to €1,577 per sq. m.), and Lika-Senj County (1.94% up y-o-y to €1,169 per sq. m.). The Dalmatian coastal resort town of Split had the highest annual house price growth among Croatia's large cities during the year to January 2017, rising 5.81% to an average apartment price of €2,334 per sq. m., according to the property portal Njuškalo. The most expensive properties can be found in Dubrovnik (€3,349 per sq. m.), followed by the coastal resort town of Opatija (€3,113 per sq. m.) and the tourist island of Hvar (€2,850 per sq. m.). About 70,000 foreigners own property in Croatia, mostly on the Adriatic Coast. The Northern peninsula of Istria is home to a property boom fuelled by German buying. Due to complexities regarding taxation and foreign ownership rules, most bought through a company. However, amendments made to the Croatian Law on Ownership in February 2009 now treat EU nationals as Croatian citizens for the purposes of acquiring real estate in Croatia. The right of non-EU foreign nationals to buy a property in Croatia depends on reciprocity agreements between Croatia and the foreign buyer’s home country. Croatia’s high-end residential market continues to attract foreign buyers. Most of the demand for properties in Istria come from Germans, Austrians, and Slovenians, according to Colliers International. Luxury properties in Dalmatia are popular among foreign buyers from Sweden, Slovakia, and Czech Republic, among others. Some of the second home destinations that are popular among homebuyers include Hvar, Split, and Dubrovnik. Most of Croatia's high-end property supply are found in Istria, Opatija, Dubrovnik, islands such as Hvar, Brač and Krk, and in tourist resorts. According to Colliers, new retreat resorts are being developed along the Croatian coast, which are expected to increase the supply of luxury residences in the area.